This is one of MY favorites of the bunch. I think it's an exceptionally nice two-cent piece, which according to my research was a primarily copper coin with a whole bunch of detail. It was considered "one of the least successful coins in U.S. history" due to its short production run and lack of popular appeal. But it also happens to be the very first coin inscribed with the motto "In God We Trust", so it has its place in history for at least THAT little tidbit. The reference to a deity as well as the coin itself is the result of the Civil War and the fear that gripped the nation as a result. Coins became scarce as a result of hoarders (hence the "Hard Times" and Civil War tokens also in Aunt Mary's collection), and religious fervor likewise bloomed during the crisis, although the practice wasn't wholly adopted for the entire US coinage until 1955. 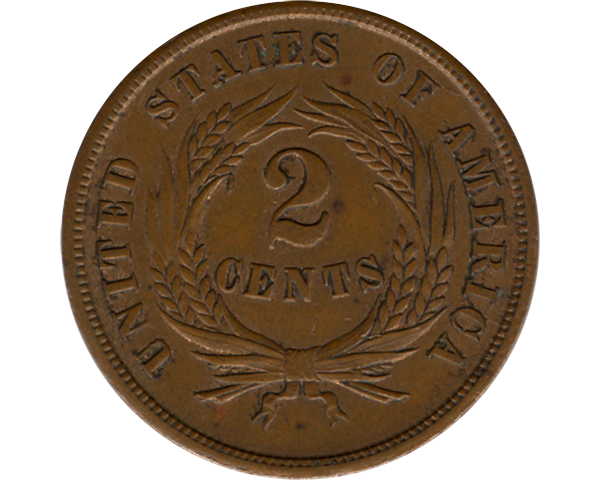 The two-cent piece was initially welcomed when it was first minted, but interest (as reflected in the number produced) dropped off every year until it was discontinued in 1873, only ten years after it was first produced.